DRS2018 are excited to announce the debate topics for this year's conference. 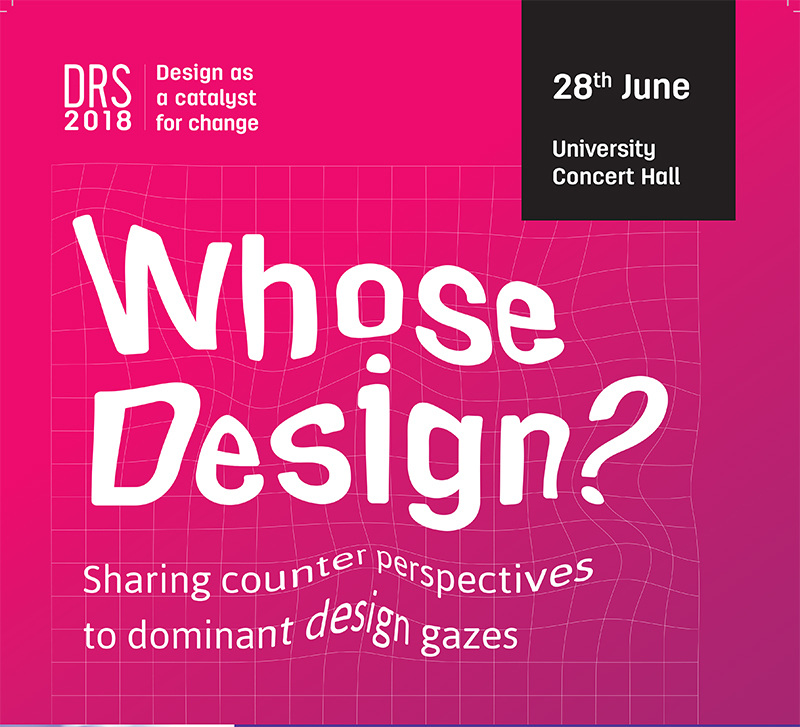 The first Keynote debate announced is titled 'Whose Design? : Sharing counter perspectives on dominant design gazes'. 'Whose Design?' poses questions around the sharing of counterpoints to the traditional design gazes. There is increasing recognition about design's key role in the creation of conditions, infrastructures, and the very worlds within which we live our lives. This recognition has fostered diverse calls for the reorientation of the design disciplines, away from the functionalist, rationalist, and industrial traditions dominant for most of their history; and towards more socially conscious, political, situated, and relational practices. In asking “Whose Design?” we seek to explore diverse understandings and counterpoints to dominant design gazes, both from the perspective of design as a noun (what is it that particular designs do in the world?) and as a verb (how should we go about designing our way out of the current mess?). Rather than offering easy and straightforward answers to these questions, what we need is to stir discussion on the nature and scale of the work ahead. Can design research offer, beyond novel methodologies, political commitments for alternative ontologies? What is it that design researchers need to do, in order to move beyond Anglo/Eurocentric and capitalistic design lenses in the short term? In the long term? Should the program be one of inclusion and reform (as in let’s include the “others,” or let’s infuse design with environmental and social justice goals), or should the program be one of significant transformation (as in let’s reimagine design’s core categories altogether)? The conversation will build bridges between certain trends in decolonial, feminist, and indigenous (amongst others) theories and debates around the world, on the one hand, and design theory and practice, on the other. The aim is to identify points of tension but also synergies between these two knowledge, activist, and professional domains. The debate will be moderated by Dr. Andrea Botero. Andrea brings with her a wealth of experience and expertise. She is a Colombian born, Finland Based designer and researcher. Her work engages with the possibilities, and contradictions of participating in the creation of environments, tools and media that afford more relational and caring interactions among, and between people and their environment. In particular, she studies how the design of communication and information technologies shape the social outcomes, practices and horizons of possibilities for communities and collectives. She is currently a Postdoctoral researcher at the University of Oulu in Finland and conspirator at the practice based research studio Suo&Co. The debate participants will be Sadie Red Wing and Arturo Escobar, both bring different perspectives to the dominant design gazes, a rich discussion can be expected! Sadie is a Lakota graphic designer and advocate from the Spirit Lake Nation of Fort Totten, North Dakota. Red Wing earned her BFA in New Media Arts and Interactive Design at the Institute of American Indian Arts. She received her Masters of Graphic Design from North Carolina State University. Her research on cultural revitalisation through design tools and strategies created a new demand for tribal competence in graphic design research. Red Wing urges Native American graphic designers to express visual sovereignty in their design work, as well as, encourages academia to include an indigenous perspective on curriculum design. Currently, Sadie works as the Assistant Director of the Native Student Programs at the University of Redlands where she supports and provides resources to indigenous students during their journey through higher education. Her work has been featured on AIGA’s Eye on Design: “Why can’t the U.S. decolonize its Higher Education?” and Communication Arts: “Decolonizing Native American Design” (2017). Arturo is Professor of Anthropology at the University of North Carolina, Chapel Hill. His main interests are: political ecology, ontological design, pluriversal studies, and the anthropology of development, social movements, and technoscience. Over the past twenty-five years, he has worked closely with several Afro-Colombian social movements in the Colombian southwest, particular the Process of Black Communities (PCN). His most well-known book is Encountering Development: The Making and Unmaking of the Third World (1995, 2nd Ed. 2011). His most recent books are Sentipensar con la Tierra. Nuevas lecturas sobre desarrollo, territorio y diferencia (2014; French edition May 2018), Otro posible es posible: Caminando hacia las transiciones desde Abya-Yala/Afro/Latino-América (2018; English edition 2019) and Designs for the Pluriverse. Radical Interdependence, Autonomy, and the Making of Worlds (2018; 2016 and 2017 for Colombian and Argentine editions).